Chunyan Song, Ph.D., Professor of Sociology at California State University – Chico spoke to the Southwest Technology Showcase Conference earlier this month on the topic, Promoting Student Service Learning with Web Guest Speakers. She was scheduled to speak in the Track on “Delivery: Online and Mobility Strategies.” She won the Best of Track Award at the conference. Description of Chunyan’s Presentation: In spring 2009 and 2010, she invited two guest speakers to my SOCI 354 class. The first one attended in person. The second one, their textbook author, addressed the class live from his home in South Africa using Wimba Classroom. In thepresentation, she shared her experience with bringing in both local and global guest speakers using Wimba to enhance the student learning experience. Congratulations to Chunyan Song on this award! Selecting the next LMS to replace Bb Vista – we’ve been busy! Staff from TLP and DLT (that’s Distance Learning Technologies, our friendly Vista / Wimba admins), Information Resources and, most importantly, faculty have been very busy the last two months preparing to make a recommendation about what system should replace our current Blackboard Vista LMS by the time it has to be retired (2012, by the way). We’ve been evaluating Moodle 1.9 and Blackboard’s next-gen product Learn 9.1. We’ve talked to schools that have already moved in each direction. We’ve kicked the tires. We’ve surveyed faculty about how they use Vista. There’s more to come as we get closer to a decision. To find out what’s happening, come read the LMS Crossroads Blog: http://blogs.csuchico.edu/crossroads. 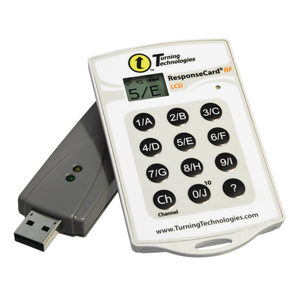 Turning Technologies will be on campus soon, to provide training for anyone interested in using clickers in their classroom. Whether you are a new user, or an experienced instructor utilizing clickers, we are providing customized training to fit your needs. One of the most valuable training sessions we will have this week is on Results Manager. Check our training calendar and register for training now! Results Manager makes clickers a WHOLE LOT EASIER! Allowing instructors to manage results stored in session files from Turning Technologies’ software. Import all results directly into Blackboard. Simplifying and eliminating issues revolving around matching students to their clickers and pulling participant lists. Track participant performance over a period of time to determine cumulative scores or statistics for individuals and groups. Ensure that objectives are met and learning has occurred with our easy-to-use application for tracking and reporting. New Users (Turning Point): A slightly more in-depth look at Turning Point than the combined session, this workshop is designed to not only let an instructor use Turning Point in their classroom, but also master a few of the more advanced features, such as Reports, RePolling, and Session Management. Turning Point Anywhere: This session will cover all aspects of Turning Point Anywhere, from running a session, to tracking participants, to creating a participant lists. If time allows, all advanced topics will be covered as well, such as Session Management and the Registration Tool. A workshop that covers both Turning Point and Turning Point Anywhere, this program will allow an instructor to learn the basics of both programs, from tracking participants to running a session. After completing this workshop, an instructor should feel comfortable running either application in their classroom. Design a class to fit you or your department’s needs! We are able to add classes at alternate times and customize classes to fit your needs. Let us know what you are looking for! Contact Laura Sederberg, lsederberg@csuchico.edu for more information.